The two top players raked in a mammoth share of 77% in the global sporting guns market in 2015. Smith & Wesson Holding Corporation and Strum, Rugner & Co. have held a dominant position in the global market due to their international presence and an unwavering brand value. Transparency Market Research states that the companies design, manufacture, and sell products that will have innovative technologies. “Strum, Rugner & Co. is focused on developing sporting guns with lean methodologies for effective fulfillment of the demand,” states the lead author of this research report. 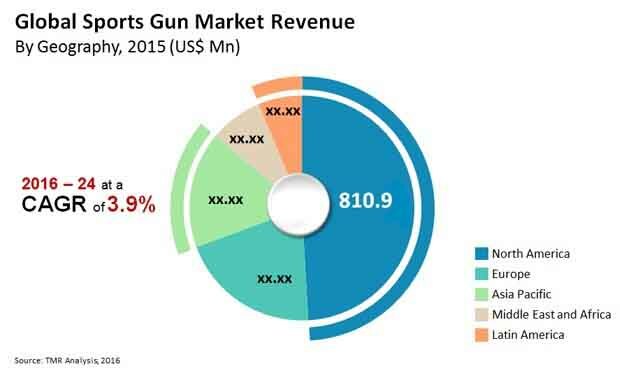 According to the research report, the global sporting guns market is expected to be worth US$2.3 bn by the end of 2024 as compared to US$1.6 bn in 2015. During the forecast years of 2016 and 2024, the global market is anticipated to progress at a CAGR of 3.9%. Geographically, North America is projected to lead the global market as the region is estimated to account for a share of 49.3% by the end of 2024. The expansion of North America sporting guns market will be attributable to the booming rise of participation in a wide range of sporting events that use sporting guns. This trend is also expected to impact the sales of competitive shooting guns, which are projected to skyrocket in the coming years. The research report anticipates that the competitive shooting guns segment will acquire a share of 43.9% by the end of 2024. The growing participation in competitive sports such as the Olympic Games has augmented the demand for sporting guns in recent years. The rise of several games that involving shooting are anticipated to play an integral part in the growth of the global market. Games such as paintball shooting are also adopting sporting gun or recreational guns. The rising awareness about benefits of participating in shooting games such as improved concentration, enhanced eyesight, and sharpened focus and precision is also coaxing several people to take up shooting as a sport. The growing popularity of shooting games across Western Europe and North America have provided an international platform for several participants. The sheer difficulty of the sport has created a demand for technologically sound products that are designed with unmatched logic and perfect mathematical calculations. Analysts anticipate that the growing inclination toward shooting as a sport is likely to stir a prolific demand for sporting guns during the forecast period. Furthermore, the ongoing efforts to replace old shooting guns for sports with new and improved ones is also projected to raise the demand for new sports guns. Presently, the U.S. holds a significant share in the overall market and is projected to retain its dominance all throughout 2024. The global market is being restrained by the increasing cost of manufacturing and the high cost of components that are being used in making sports guns. This has sorely discouraged the shooting community in the Middle East, Japan, and Korea. The demand for sporting guns are also severely dropped in several developing economies in recent years as importing them means paying high tariff rates and manufacturing them means incurring huge expenses. The market is also being stymied by the stringent regulations pertaining to hunting games. The growing worries about prolonged hunting that have brought several animals on the brink extinction has also set the demand for hunting guns on a downward path.